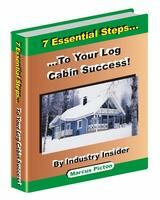 By using log-cabins-revealed.com you accept the terms as set out in this document. Should any part of this document not be acceptable to you and you wish to use this website, please e-mail us using the contact us page and state the exact issue which you have with the website. If you do not agree with the terms of this website and do not want to contact us on the matter (in order to try and resolve or make clear any matter), please cease using this website immediately. Any information contained on log-cabins-revealed.com, or withins its' communications, is the property the owner of this website. All rights are reserved. No content in any way can be reproduced (in part or whole), without the express permission of the site owner Sylvia Picton. This website is for your own personal, private use and is not to be used commercially. You are allowed to print any pages for your own personal use. Anyone reproducing any material from this site for commercial gain (be this on the internet or otherwise), is infringing our copyright and procedures will be taken to ensure this is dealt with appropriately.